The Light weight thumb style flowerpot set is ideal decoration for garden,home,restaurant,store,office and etc. * The interior of the pot has a hole at the bottom, which allows for the proper draining. The 6pcs hole mesh pad is neccessary to stop soil leaking out. *Give this set of small planter pots as thoughtful gifts for family and friends, or keep them in your own home to add fun to your living space. * Suitable size for fern, moss, succulent, cacti or other plants with easy maintenance.Good for water controlling for succulent plants. * Amazing to artificial flowers or succulent plants simulation. Material:ceramic,transmutation glaze,making it breathable and good for your plants growth. 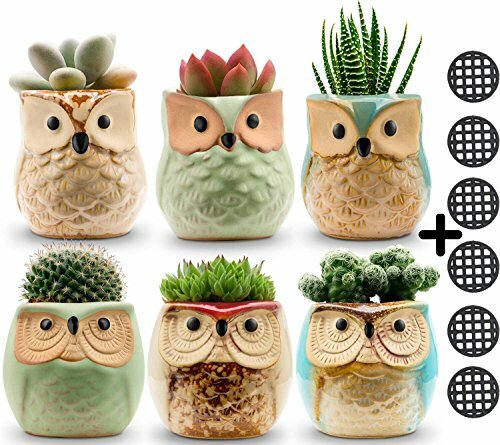 Cute Design Succulent Plant Pot:attractive owl pot is perfect to decorate your balcony,windowsill,dinning table,office desk and room,adding fun to life. Good Gift Idea:Adorable animal planter is good gifts choice for kids,parents,friends,schoolmates or colleague for any festival. Each pot is with a hold at the bottom and hole mesh pad to stop soil from leaking out.Buy with confidence.The pots are protected well,There is very little breakage.If there is any damage,pls contact us via email to resend or refund.